Thing 1 (the 10-year-old) got Monopoly for Christmas. It came in a wooden box, and everything except the logo in the center of the board is retro. It’s a nice, as Monopoly sets go. Growing up, I was never a fan because it took forever to play. I’d bail after a couple hours, and I was never around when the game finally ended. Sweetie’s been at work, though, and I’ve been off, so I thought I’d give the game a second chance. Thing 1 set up the board on the dining room table, and we’ve been playing an hour or 2 a day since Monday, and, as far as I can tell, we’re just getting started. We’ve bought and developed property, gone to jail and collected $100 when our building and loans mature. Thing 1 has a monopoly on utilities, but we own 2 railroads each. We roll the dice, pass go and collect $200, over and over and over again. So, here we are. Right now, I have a little more money then Thing 1 does, but that could change if I land on Boardwalk again and have to give her $1,400 in rent. We’ll keep playing until she’s tired of the game, or Sweetie reclaims the dining room table or Thing 2 (the 4-year-old) messes up the board. Which is fine, because, honestly, I can think of a lot worse ways to spend New Year’s Eve. You must not be as ruthless as my Dad was when we played Monopoly growing up. Our games never lasted that long and Dad always won. He still does playing 500, cribbage, chess, ping pong, and Dirty Harry. Oh, gma, you’d be appalled at how our family plays games. We’re absolutely ruthless and talk trash constantly, mostly silly things like, “A-ha, you’ve fallen into my trap,” and, “You smell like cheese.” I think it’s OK, because we know we don’t mean it, and, besides, Thing 1 usually wins, anyway. I think there’s a lot of truth to that. We had game night with another couple a few years ago. Sweetie and I kept winning. The husband took it in stride and had a good time, anyway, but the wife became really defensive. She eventually had an affair and filed for divorce. Of course, our winning at game night had nothing to do with that, but it sure showed us the dysfunction in that marriage! Thing 1 will always hold dear these memories of her Dad playing Monopoly with her. Very special, Todd. When my Mom was a teenager, she had a boyfriend who would visit her and play Monopoly and he would always win. One day he lost, and he left in a huff, without his Monopoly set and my Mom never saw him again! Happy New Year – hope you make some good money there! That’s funny. Your mom’s better off without him. I wonder what become of him. 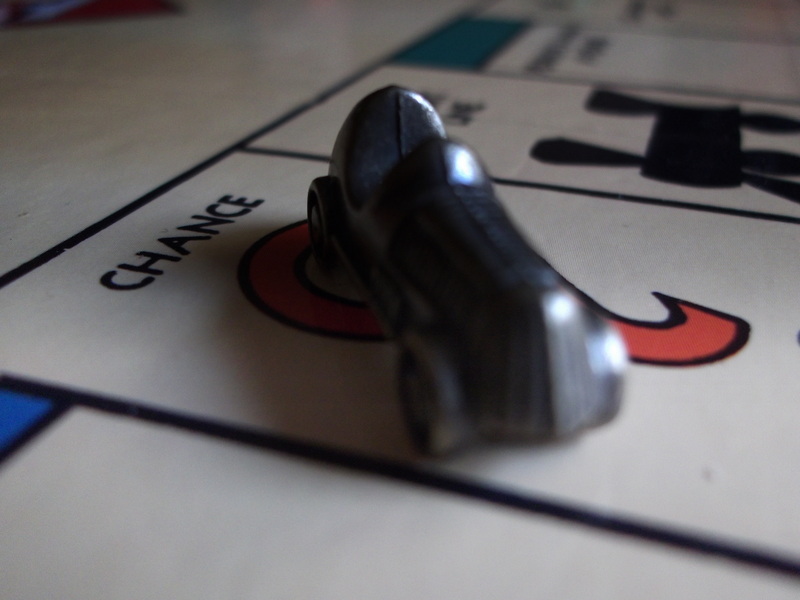 We’ve found that Monopoly games run faster when we play by the original rules rather than our favorite house rules. When there’s no financial windfall from landing on free parking and unpurchased properties immediately go to auction the bankruptcies come on quickly. Then again, we’re playing the Washington, DC-version of the game so its natural disposition is to go broke. Boy, does this conjure up the memories! My Favorite Domer and I would set up a Monopoly game when he was little, and it would go on for DAYS! Even now, when he comes home from college for extended vacations and gets bored with video games, etc., he’ll suggest we play Monopoly (pronounced mono-poly, of course!) And you’re right — there are plenty of worse ways to spend a long winter’s night! That’s great that he still likes to play games with you! Hope we’re as lucky! Aw. This is great, Todd Pack. First, big thumbs up on the retro board. My dad and I used to play Monopoly for hours and hours. At the age of 10, I could never quite grasp why Baltic Avenue was a better buy than Park Place. But I totally get it now. Happy playing! And happy New Year! ahhh, I avoid Monopoly for the same endless reason and that my 11 yo is a wiz-kid and slum lord. Happy New Year Todd. Sure have enjoyed your blog this year. Thanks a lot, Tammy. The feeling’s mutual! I don’t play board games. Joe played endless games of Monopoly and candy land with our son. He always let him win when he was little, worked up to tying when Cole could tolerate more competition and finally won a game or two when the playing ground was more level. I marveled at his patience. Books, puzzles, and crafts were more up my alley. I always had the feeling Monopoly never ended but was a game of endurance. I used to let the kids win. Now they beat me on their own! Happy New Year to you, too! I think the game table being reclaimed is the only way I have ever seen a Monopoly game end. Since this morning, we’ve built a lot more hotels, so I’m thinking the end is in site. Still, I don’t think we’ll finish until sometime in early 2011. Anna asked for Canadian Monopoly for Christmas…she wants to play it tonight…not sure if I will! My brother and I used to play the regular one all the time as kids…it lasts forever! Glad you play games with your kids…one we used to play a lot as a family (when I was growing up) was Rook…I bought one last year at Christmas as a surprise for my dad! U.S. Monopoly is set in Atlantic City, New Jersey, for some reason. What’s the setting for Canadian Monopoly? It’s surprising to me that Monopoly became so popular, given that it’s almost impossible to conclude. I’m not that into board games, but I’ve definitely played a few in my day. My favorites are the ones that seem to wrap themselves up in an hour, or rather, the ones that are the opposite of Monopoly. It does sound like a fun New Year’s Eve, though. Wishing you a great 2011. I love playing board and card games (it’s Day 6, and we’re still playing the same Monopoly game), but when Thing 1 asks whether I’ll play LIFE, I always tell her, “I don’t have to play it. I live it.” Seriously, earning a degree, choosing a career, having kids, buying insurance and saving for retirement just isn’t my idea of fun. Every single time I have ever played Monopoly, it has been with people who take it waaaaay too seriously. I like the idea of a retro set, and I love the idea of the memories you’re creating for Thing 1. I hope you got a “Get Out of Jail For Free” card. Those can come in handy. Happy New Year to you, Sweetie and the Things. I’ve always been like you: It takes too long to play! Good for you for giving it another chance! I think the end’s in sight. Last night, I had some bad rolls and landing on several of Thing 1’s properties one right after the other, so I’m several thousand Monopoly dollars poorer. Couple more rounds like that, and I’ll be bankrupt.